From June 26th – July 2nd 2017 Frankfurt will turn into a vibrant hub for open exchange, hands-on experiments and reflection combining creative coding workshops, AV performances, laboratories, artist talks, engaging debates and an exhibition. With the leitmotif ‘Designing Hope’ NODE will discuss an intangible yet powerful motor that drives ideas of a better future. The program will analyse the role of technology in the creation and manipulation of these collective imaginaries. How do today’s communication infrastructures determine the formation of public opinion? Are we living in a global village that is accessible for everyone or in secluded, exclusive bubbles? What do we expect from creative technologists who dedicate themselves to developing the next life-improving or life-extending tools? Are critical creative practices able to shape responsible design? NODE is the meeting point for an international community of vvvv enthusiasts, creative coders, artists and a curious public. 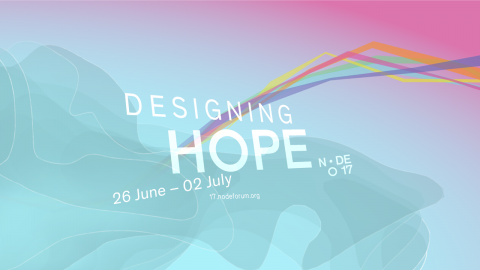 Creative minds from all over the world get together to share, discuss, criticise, look ahead, code and build NODE17 Designing Hope. We are looking forward to your ideas for talks, workshops, performances, artworks and all sorts of contributions to a vibrant discussion. We encourage all groups and individuals to take part thus special attention is paid to works and proposals by members of groups that are underrepresented in the creative coding, AV and media art scene. Send in your proposals until March, 31st! Submit your project and become part of a week long creative exploration of technologies!